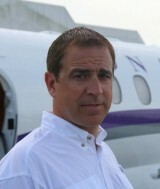 Some people begin the journey to success in a particular endeavor endowed with obvious natural talent. Others, however (and most, as it turns out), are not so gifted. This second group has to work harder to do what the first group was able to do naturally. Over time, however, the differences between starting points fade away. Most people are average. While this is true statistically, it’s hard to swallow emotionally. As a result, most people think they are above average. Researchers Dunning and Kruger report that people who overestimated their ability at a task adjusted their opinion of themselves upward when confronted with data depicted the ability level of others sampled. In other words, people generally think they are pretty good at something even when they are not, and when shown data of how others perform at the same task, they increase their “illusory superiority” to an even higher level! Those of us who teach and coach others in the topic of success and high achievement never cease to be amazed at the response of certain people when they are forced to confront the reality of their performance (or lack thereof) in an objective fashion – that is, when they must face a true scoreboard of their performance. Claims that the game is stupid or unfair. Quitting the task altogether in favor of a retreat to an endeavor where their individual performance can be masked, hidden or unobserved. But none of us need fear the scoreboard. Instead, we should embrace it as the positive-pressure cooker of our personal improvement. So, how do the differences between starting points and talent levels of individuals fade away over time? Consider the chart below. Although drawn arbitrarily, it mirrors the principle of the power of exertion, over time. Note that a large range of effort brings roughly the same in terms of results. In that band is “mediocrity,” an average amount of results from most participants. For any given endeavor, this is where most people live. But for some reason there is a small, self-selected group of individuals who push harder, who consistently give more effort, who take the endeavor much more seriously. The greatest achievers, however, push even further. Just 5 percent more effort, taking them to the maximum of 100 percent, is enough to generate as much as 10X the result. 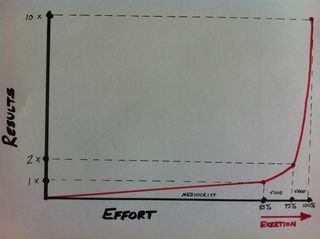 The closer one gets to maximum effort, the more of an exponential one can expect to see in results (given enough time). 1. If you are the type of person who has always felt a little behind others, a little less gifted, or a little put down, the good news is that with exertion into the upper ranges of effort, sustained over time, you can achieve excellent results. No matter your starting point, you can make it, if you work hard enough, consistently enough, and long enough. 2. If you are the type of person who has always felt a little ahead of others, a little more gifted, who have always had a little easier path, the bad news is that you cannot rest on that as a sustainable advantage. If you don’t eventually push yourself into the exertion zone toward excellence, those who are working harder will eventually pass you by. However, if you can somehow adopt their hunger and work ethic, you might just be uncatchable. Either way, don’t learn the wrong lesson. The less gifted should never feel permanently disadvantaged because of their starting point, while the gifted should never count on their natural advantages to sustain them long term. Over time, excellence goes to the consistent hard worker. 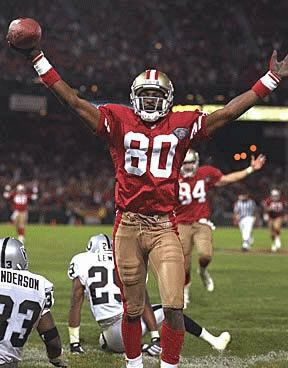 Jerry Rice is often talked about as the best wide receiver in the history of the NFL, and sometimes even considered to be the best all around football player ever. Yet in his youth he was only able to garner collegiate scholarship from the relatively small and unknown school, Mississippi Valley State. His professional prospects were quite a bit better, based upon his collegiate performance, but still, he had not been expected to be taken until the sixth or seventh round in the NFL draft. One coach, however, understood his worth. Bill Walsh of the San Francisco Forty-Niners was looking for exactly the kind of player Rice had made himself into: quick, precise, and incredibly hard working. With these basic foundations, Walsh knew he had found what he was looking for to complete his high-percentage offense featuring the accurate and precise quarterback, Joe Montana. For the next twenty years Jerry Rice continued to work at an intimidating pace to perfect his craft. Even after winning multiple Super Bowls and MVP awards, Rice demonstrated an uncommon hunger to push himself to maximum effort in the pursuit of excellence. A man with perhaps only above average talent, with literally hundreds of others “ahead” of him on the talent scale, had worked himself into icon status. So how does one keep himself in this “exertion zone?” How does one stay at high effort over time? 1. A Deep and Abiding Purpose: The more noble your cause the more your efforts will be able to withstand the lure of distraction, the pain of discouragement, and the poison of critics. 2. Informational Reinforcement (see the LIFE portfolio of subscription products for this purpose): e need a constant, consistent flow of information and motivation to sustain us in our quest. 3. Relational Reinforcement (see the LIFE Live seminar events): We need to surround ourselves with people who lift us up, encourage us, and inspire us to be better. 4. Self Talk (and personal affirmation statements): It’s important to control what we say to ourselves. 5. Remember that you are NOT average, by choice: Excellence is attainable through exertion, no matter where you begin on the talent scale. So get yourself into the Exertion Zone now, and stay there! Excellence awaits you!